For men, prostate health becomes increasingly more important as we age. Swanson Premium Pumpkin Seed Oil offers nutritive support for a healthy prostate. Pumpkin seed oil contains a high content of healthy polyunsaturated fatty acids, tocopherols and sterols, which provide unique nutritive benefits for prostate health, plus support cognitive function, brain development, cardiovascular health, blood sugar metabolism, and healthy skin, joints and connective tissues. Product labels may vary. Same formula. New look. HELPS MAINTAIN PROSTATE HEALTH-As a source of phytochemicals and zinc, pumpkin seed oil helps promote prostate health and urinary health in men as they age. 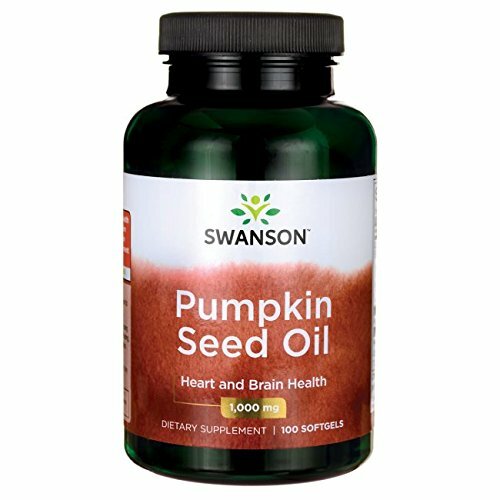 Our Swanson Premium Pumpkin Seed Oil also supports the reduction of dihydrotestosterone buildup. LOADED WITH HEART AND CARDIOVASCULAR SUPPORT NUTRIENTS-Pumpkin seed oil has a high phytosterol content. Phytosterols, or plant sterols, are naturally occurring compounds found in plant cell membranes that are well-known for their ability to support healthy cholesterol levels already within the normal range and promote cardiovascular health. HIGHLY BIOAVAILABLE FOR EASY ABSORPTION-Pumpkin seed oil contains two forms of vitamin e, alpha-tocomonoenol and gamma-tocomonoenol. These active forms of vitamin E are important for overall health and wellness. 100% MONEY BACK GUARANTEE-Our products reflect our commitment to giving you the best quality and service at the best price. We guarantee that every product you purchase is made from the purest, freshest nutrients and meets the highest quality standards. If you aren’t completely satisfied with any product(s) purchased within the last 30 days, simply return the unused portion to us for a full refund. OUR QUALITY AND HERITAGE – We’re control freaks…in a good way! For nearly 50 years, Swanson Health has delivered science-backed health products worldwide. In 1969, we began in Fargo, ND with a mission to offer wellness solutions that help people live simply healthier together. Our facilities are Good Manufacturing Practice (GMP) certified, and our purity and potency testing includes independent third-party labs. Clinical research, scientific consensus and usage traditions guide our innovation.